Gearing up for a fabulous 2019? If you are, then one of the things you might be working on is a new sales presentation. This is such a great opportunity for you to shine, leave a lasting impression and convince a prospect that you are the obvious choice. There are many types of social proof, but for presentations, we like to use testimonials. Why? Psychology. Social proof has been studied for decades, and researchers have found that people conform to what the group is doing for two reasons. They don’t want to be left out, and they believe the group knows better than they do. Testimonials from current clients are so important to the sales process that we like to lead off a sales presentation with a few – and add one more at the end. Talking about results that other clients have experienced is also a marketing technique rooted in psychology. In this case, it’s FOMO – fear of missing out. You can talk about individual client results or average results across the board. Either way, you are not only proving that you can deliver, you leave a prospect eager for those same results. Your sales presentation should be completely focused on what you can do for the client, not what you do. 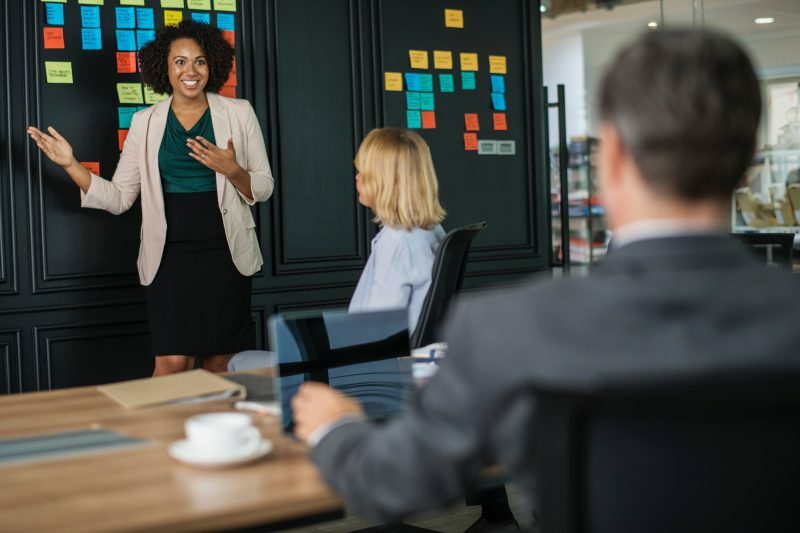 It is highly unlikely that if you’re at the stage of giving a sales presentation, the prospect already knows what you do. Discuss product or service benefits, not the features. Explain how your approach is better for clients. Talk to the client, not at them. When you do talk about your company, keep it brief and centered around your story. Why did you (or the owners) establish the company? That’s interesting and can create a connection. If you try to cram every word onto a PowerPoint slide, your prospect will read the slide and ignore what you’re saying. Keep high-level talking points only. Better yet, I challenge you to only use a headline and an image or graphic on each (or most) slides. The prospect will have no choice but to pay attention to what you’re saying. As tempted as you are to shove all the details into the sales presentation, save those for your fabulous proposal. A small investment in a graphic designer can pay off, especially if you’re pitching a large company. Forgive me for pulling psychology into the conversation again, but it’s important to understand why. Ever hear of the halo effect? It’s an interesting concept in which the perception of positive qualities in one thing or part gives rise to the perception of similar qualities in related things or in the whole. If your presentation is polished (both visually and in your delivery), the prospect will then assume that your entire company is top-notch (which of course it is). The halo effect is very powerful, so again, use this to your advantage. Not sure if your sales presentation is up to snuff? We are more than happy to help out. Shoot us a note!